Our Signature LiquidLift is made up of a series of minimally invasive procedures that together can make you look 5 to 10 years younger, with little or no downtime. Our skilled injectors are trained on a regular basis with the latest techniques to give you the best results. By combining technique and products, a lift is given to the face for a more rested youthful appearance. The results is a natural looking more youthful face that can last up to 7 years. IS A LIQUIDLIFT FOR ME? Liquid Face Lift procedures have been making a noticeable impact in aesthetic medicine during the past few years. A liquid face lift can help many individuals who are concerned with any one of a variety of issues, as well as providing an alternative for a traditional surgical face lift in a number of instances. Something to consider when contemplating surgery is that a liquid facelift has benefits that can't be found with surgery, such as restoring natural facial contours and volume. (A growing number of cosmetic surgeons are augmenting surgery with liquid face lift products to restore natural 3-dimensional contours to the face.) 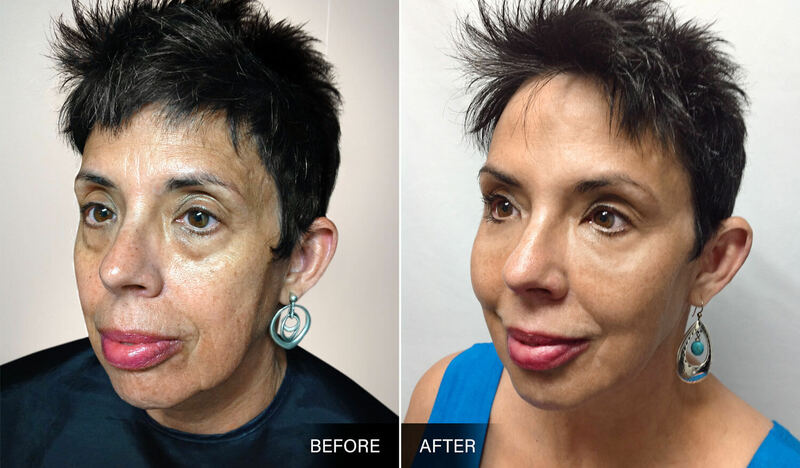 Also, a liquid face lift is typically more subtle than surgery. An increasing number of individuals are trying liquid facelift procedures before traditional face lift procedures. You want the down turned corners of the mouth lifted for a friendlier smile - you want to look more rested and energetic - you don't like the bags, dark circles or sunkenness under the eyes - you want your upper eyelids and brows more open, alluring and vibrant - you wish your jowls weren't so noticeable - you wish you had some of the natural curves and dimensions that have flattened or squared over time - you want less wrinkles -or- maybe you want a general overhaul. STICKING WITH SKIN CARE CREAMS & PRODUCTS? As compared with the potential for a liquid facelift, over-the-counter creams, ointments and other remedies rarely provide any meaningful lift, volume or contouring of facial features. (However, some topical applications can help slow facial features from needing a liquid facelift, and a few over the counter products – and several medical grade products – can enhance the endurance of liquid face lift procedures. Ask your physician.) Skin care products treat the skin from the outside and liquid face lift products treat the skin from the inside. The right mix of treatment regimens can be very complementary to maintain natural facial contours for a lifetime.